The two Devil’s Canyon CPUs are part of a three-way release for Intel, with the announcement earlier in June and a full retail release by the end of the June (depending on location). The three CPUs are the dual core Pentium Anniversary Edition G3258, which we have tested and will write up in its own review, and the new Core series models, the quad-core i5-4690K and the quad core with hyperthreading i7-4790K. There are several reasons why the Pentium is not part of the 'Devil’s Canyon' line up, which we will go into in that review, but the Core models are upgrades of the i5-4670K and i7-4770K respectively. I will address the latter point first. According to my sources, these are extra decoupling capacitors in order to help smooth the delivery of voltages from the FIVR (fully integrated voltage regulator) to the various parts of the CPU. When at the high end of overclocking, reaching the limits of stability (limited by voltage for a given frequency), this should help maintain a constant voltage especially when load-line calibration settings are fixed. This should have ramifications for home users wanting to overclock significantly (4.7 GHz+) and are on ambient cooling methods, but it would seem that Intel’s main focus would be to assist sub-zero overclockers competing for records. So why is helping the extreme, sub-zero overclockers a priority for Intel? The extreme overclocking community numbers a few thousand worldwide at most, but their exploits are often used in marketing material with Intel’s partners, such as ASUS, GIGABYTE, ASRock and MSI. One of the main criticisms for the Haswell line of overclocking CPUs was the inconsistency for these CPUs to hit high frequencies on a regular basis, with many enthusiasts testing several dozen (or even 100s) in order to find a good CPU for benchmarking competitions. This upgrade should be a nod towards that community, at least on paper. Going back to talking about 24/7 overclocking, and the original launch Haswell CPUs have been varied in their performance. Anecdotally, I have had three i7-4770K CPUs to test, and with my concept of benchmarking stability (5 minutes OCCT and a POV-Ray test, max temperature 98C), one reached 4.7 GHz at 1.35 volts, one reached 4.6 GHz at 1.40 volts and another struggled to get 4.3 GHz at 1.40 volts. Initial reports showed that these CPUs ran hotter than even the previous generations, Sandy Bridge and Ivy Bridge, at a given frequency. This limited their overclocking potential on air and water. The move from Ivy Bridge to Haswell was an architecture change, with the focus on power savings and performance benefits taking advantage of the 22nm node rather than all-out performance at the expense of efficiency. There were many comments from users who were not expecting the new CPUs to be so varied, or that the peak temperature was reached so quickly. After all, the overclocking CPUs are expected be the highest quality silicon from the production line, the feeling that they varied so much was not a welcome characteristic. At the time, the suggestions were clear: for users running a good Sandy Bridge or Ivy Bridge CPU on a nice (4.6 GHz+) overclock, despite the IPC and power improvements for Haswell, the only reason to change might be for the chipset improvements. As a result of these temperature issues, there was a lot of user research done into the reasons behind the increase. Most users complained on the issue of the thermal interface material being cheap, rather than soldered on which happened in older generations. Successful delidding (removal of the heatspreader) of CPUs and replacing the TIM led to various reports of a 10-20ºC drop in temperatures at a given voltage/frequency combination, and this has even led to MSI providing a shim with some of their Z97 overclocking motherboards so users who do delid can still provide an offset between the PCB and the die for air/water cooling. 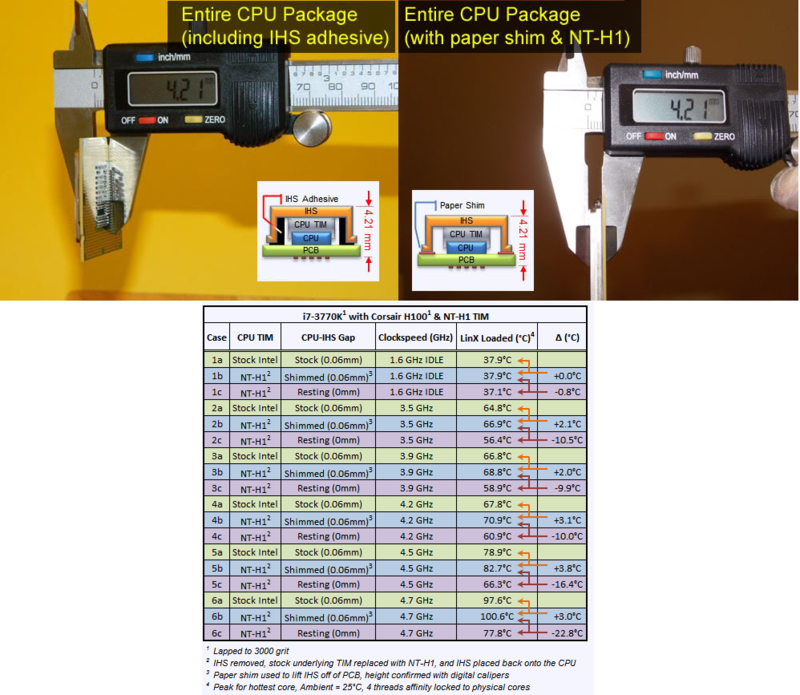 AnandTech Forum admin Idontcare posted an in-depth report regarding the dimensions of the CPUs, and his experiences with this type of packaging. His conclusion was that, for his Ivy Bridge CPU at least, the height of the heatspreader above the die was actually the cause for concern, with the heatspreader adhesive actually raising the heatspreader too far off the die, meaning that the gap was larger than expected and the TIM could not work properly. In fact, his conclusion is that the TIM is perfectly fine, but this gap is causing the issue. 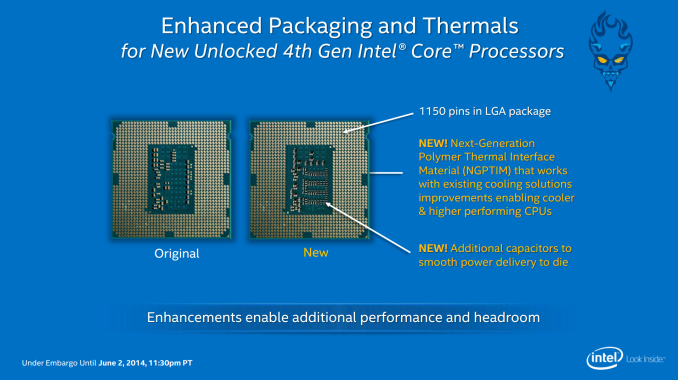 For Devil’s Canyon, Intel is addressing the first issue, the quality of the thermal interface material. Their phrasing is to use a ‘Next Generation Polymer’ type of TIM, which is nice and ambiguous for any material scientists out there. The fact that it says polymer is a big clue that we are dealing with a silicone based TIM. ‘Next-Generation’ could easily mean version 2.0, so is almost non-descript and purely a marketing term. However, in order to increase the thermal efficiency of the TIM, I would hazard a guess that the TIM is more dense, and thus the polymer chains would either be longer or heaver (by using modified starting chemicals/catalysts), or the suspension matrix is different. These silicone based TIMs often hold a suspension of ceramic powders, which can also affect the thermal conductivity by a factor of 200x. ‘Next-Generation’ could imply that the ceramic has changed (this would also change the viscosity, perhaps severely so) to one with a higher thermal conductivity. The movement from a zinc-oxide filler to an aluminium based filler would offer a 2x improvement in thermal conductivity for the minor added expense, as well as cause a color change combined with a viscosity change. 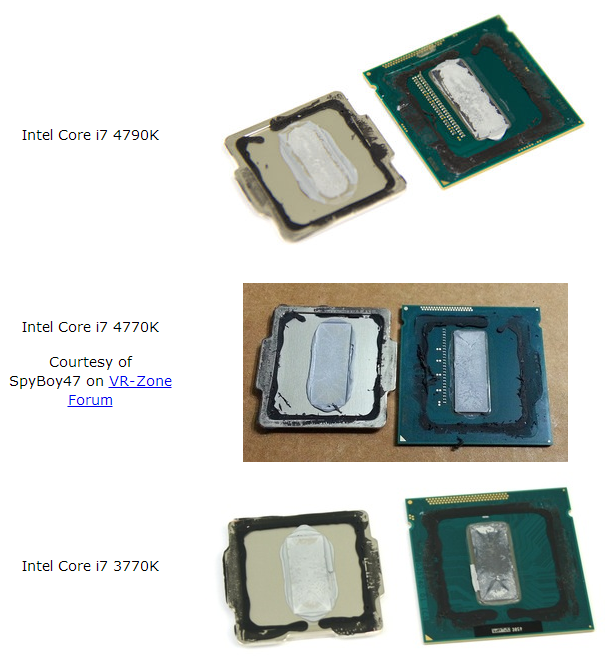 Comparing the i7-4790K to the i7-4770K, aside from the increase in internal capacitors (again, for power regulation), the TIM has changed more from a silver material to a whiter material, similar to that of the 3770K. The cynic in me would suggest a movement to a zinc-based ceramic filler, given that zinc is a d10 metal (10 electrons in its outer shell) and forms an extremely white powder when in the zinc oxide form, so much so that it is added to paints as a white pigment (similarly to titanium dioxide). However aluminium oxide is also white, and has a much higher thermal conductivity than zinc oxide when used in a thermal interface material matrix (quoted as 30 W m-1 K-1). The viscosity would be dependent on the size of the nanoparticles used against the matrix itself, but one could argue that the aluminum based TIM should be slightly more expensive than the zinc based TIM. It is worth noting that the black IHS adhesive is still present, in what looks like similar quantities. So should the black adhesive be the mitigating factor, users who have delidded and adjusted their previous CPUs might not see much of a difference (or a regression) by switching to an out-of-the-box Devil’s Canyon if the temperature issues are well and truly fixed. 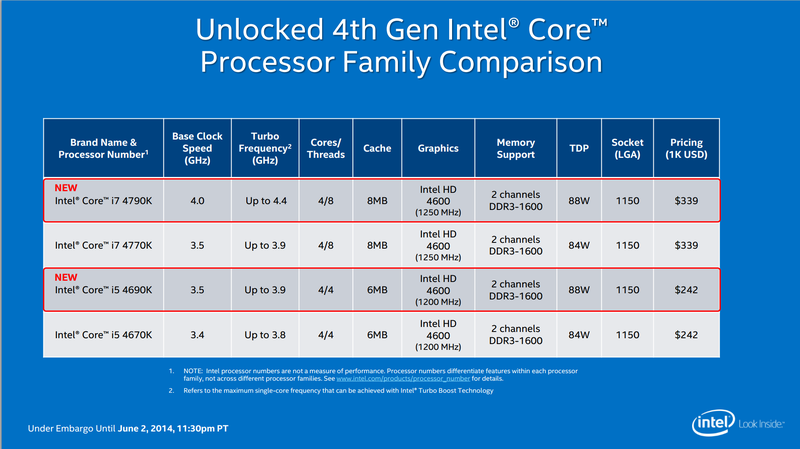 The big news in the specifications is that the i7-4790K is clocked much higher than was previously expected. The i7-4770K, its predecessor, was rated at a 3.5 GHz base frequency and offered a turbo speed for single core workloads of 3.9 GHz. The new i7-4790K will come with a 4.0 GHz base frequency (Intel likes to point out this is their first commercial quad-core CPU with a 4.0 GHz base clock) which offers a 4.4 GHz Turbo Mode. An extra 14% frequency for a similar price is not to be sniffed at although Intel does quote the TDP rising from 84W to 88W. 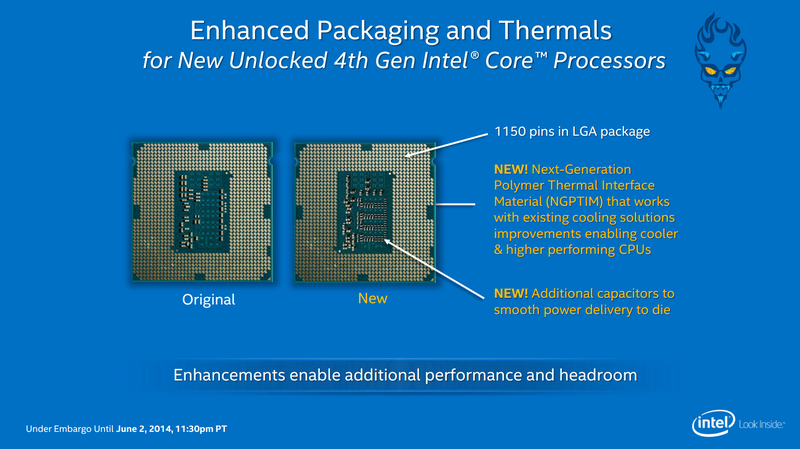 The i5-4690K is more like the Haswell refresh samples, marking a small +100 MHz increase in frequency over the i5-4670K. Here we move from a 3.4 GHz base / 3.8 GHz turbo to a 3.5 GHz base / 3.9 GHz turbo increase, and again an increase in TDP from 84W to 88W. Both new models are also listed as supporting TSX-NI and VT-d. The CPUs still use the LGA1150 socket, meaning compatibility with 9-series motherboards and most 8-series motherboards (when the motherboard manufacturers release relevant updates for 8-series). We suggest that if you intend to purchase an 8-series motherboard with one of these CPUs that you contact your retailer ahead of time to confirm BIOS versions. The increase in frequency for the top end i7 puts more distance in terms of CPU performance between that and the i5, which judging by the price difference might be significant, especially for prosumers that are CPU-bound. Things are less clear in the gaming arena, although we have tested both CPUs as well as with overclocks to see how they pan out. There was a lot of talk regarding the magic ‘5.0 GHz’ number and whether it would be easily achievable with these new processors. At Intel’s overclocking event at Computex this year, the highest frequency achieved with an all-in-one closed-loop-liquid-cooler was 5.5 GHz, although this was only stable enough for a CPU-Z screenshot and the air passing over the radiator was cooled with liquid nitrogen, so not a realistic scenario. Other reviews on these processors have had a hard time hitting 5.0 GHz stable, with most falling short by a couple of hundred MHz. In order to even discuss this, we first have to look at the silicon itself. All arrows point to an unchanged silicon die, but an updated package, which would suggest that the overclocking performance of these new processors might match the old, but with more thermal headroom. Although one could also suggest that Intel has optimized the process in the fab to enable a different distribution of bin yields, especially when considering the new 4.0 GHz bin is considerably higher than the others. This would arguably put some positive note on the i7, given that there were some rather poor overclocking i7-4770Ks in the wild and the i7-4790K seems to raise that minimum barrier by default. Without having a couple of hundred CPUs to test, we cannot produce a histogram of expected overclocking results. However I can add in our results here, with a clearer explanation later in the review. Our i7-4790K is actually one of the lower performing CPUs from what I have heard from other reviewers. Using a Corsair H80i (the 120mm double thickness CLC), our CPU hit 4.6 GHz at 1.300 volts, with 86ºC peak temperature under OCCT load, and 4.7 GHz at 1.450 volts with 98ºC peak temperature under OCCT load. 1.450 volts for 4.7 GHz is rather a lot, and under a focused AVX load the system did actually reduce the frequency to 4.5 GHz for split-seconds to remain within thermal tolerances. That jump from 4.6 GHz to 4.7 GHz of 0.150 volts is quite a leap, although we did see this with the normal Haswell CPUs as well. The i5-4670K sample we received by contrast was a relatively nice clocker, but it still had a bit of a voltage leap in the same sort of range. 4.7 GHz was achieved at a nice low 1.300 volts, with 79ºC peak temperature, however 4.8 GHz was a bit of a struggle. The system would boot very easily above 1.300 volts, but even at 1.450 volts, the system was not stable for our testing. Our G3258 (Overclockable Pentium) also does 4.7 GHz, at 1.375V stable. A contact at Corsair has two i7-4790Ks, both of which do 4.7 GHz at 1.30-1.35 volts stable. Two of our contacts at ASUS have got 4.8 GHz on their i7-4790Ks at 1.38 volts, but 4.9 is a no-go. It would seem 4.7 GHz is the magical number, at least for an open test-bed in the summer for the north hemisphere. For the users that rely on one-button overclocking, or automatic overclocking (selecting High-OC), motherboard manufacturers will have to ensure that their look-up tables encoded into the BIOS are updated appropriately. For the jump from Ivy Bridge to Haswell last year, our tests showed a 5-10% increase at the same clock speed. Because this year is just a Haswell to Haswell Redux, there is no IPC gain and thus it all comes down to clock speed. 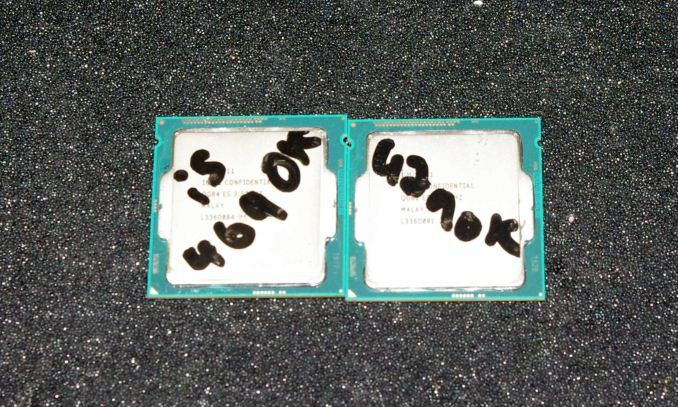 In this circumstance, the i7-4790K becomes an interesting prospect. Moving from 3.5 GHz base clock on the i7-4770K to 4.0 GHz base frequency is a >14% increase in performance at the similar price point. The turbo frequencies also gain that jump as well, from 3.9 GHz turbo to 4.4 GHz turbo, a +10% jump also. In essence what we have here is a performance jump to what we see in the tick-tock scale, albeit at the expense of power. Although the power increase is a negative, the TDP numbers would suggest that the power efficiency increases, with a 14% increase in clock speed for only a 4W jump. Our next few pages of benchmarks will confirm if this is the case or not, although it means that the i7-4790K is not just for the ‘performance at any cost’ type of customer. This 14% jump in clock speed (and any percentage increase in actual performance) is important when we consider Intel’s roadmap. 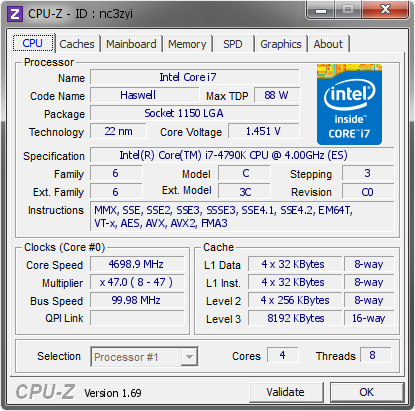 Sandy Bridge was released in January 2011, Ivy Bridge in April 2012, then Haswell in June 2013. By that cadence, we should be expecting Broadwell, the change from 22nm to 14nm, in the October 2014 timeframe. Stories of Intel’s 14nm issues have been given attention in the media, although very few details have come from Intel itself. At Computex 2014, Intel made a mobile Core-M announcement (14nm Broadwell-Y, <10W models) for the holiday season at the end of the year. There is no exact date for the official release, and for the announcement no desktop parts were mentioned and thus it is still unclear when the full desktop parts will be available to end-users. In 2013 it was debated if Intel would be bringing Broadwell to a socketed desktop platform, although that was quashed when in May Intel announced it would be releasing an overclocking SKU with the next version of Iris Pro for Broadwell, suggesting that a full range of desktop parts with IGPs would be coming to market. Different sources will claim different times for the release, either alongside Core-M or later in 2015. One could debate the impact if Intel had not released a part with 5-10% performance increase in 2014, and we can only speculate if Broadwell will offer a true IPC advantage. The question then becomes if Intel will release the equivalent of an i7-4790K with Broadwell, integrating any IPC increase with a frequency to succeed the i7-4790K. Given the lead in single threaded performance over AMD in the past couple of years in various workloads, one could also argue that Intel has had time to work on such a jump in order to placate their users and shareholders in the mainstream/performance segment. There has also been a suggestion that Broadwell-DT will only focus on the integrated graphics, and leave performance for either the extreme platform (Haswell-E) or the generation after, Skylake. The release of Skylake is even more a mystery. But there are different avenues for Intel to take when it comes to a 10% year-on-year increase in performance – either via frequencies or 10% IPC with their tick-tock. I want to inject a little of the conclusion here, beyond the overclock results above. Out of the i5 and i7 models branded under the Devil’s Canyon name, the i7 is the most exciting. The increase in single core frequency was noticeable during our testing, even for basic tasks, and moreso than the movement from Ivy Bridge to Haswell in the first place. Aside from the Dolphin Benchmark which has gains related to Haswell, the rest of the benchmark set shows an average increase from Ivy Bridge to Haswell of 7%. Those same tests, moving from i7 Haswell to the i7 Devil’s Canyon, give a 9% average benchmark increase. Most of those increases come from benchmarks that can take advantage of extra frequency due to parallelism, rather than cache limited scenarios for IPC. In particular, the video encoding benchmarks enjoy the extra frequency, but even a basic workload such as picture conversion saw an overall 19% increase from Ivy Bridge to Devil’s Canyon. Extra frequency is nothing to be sniffed at, if you do not mind that extra increase in power consumption. The main noticeable point however is that the system (anecdotally) felt faster, and the take home message is, at stock, if you need extra CPU performance and are running an i7-3770K or lower, there is a 17% boost to be had on the shelf right now, just over two years from Ivy Bridge launch. The recent yearly recommendations for the three-year upgrade cycle, for CPU limited scenarios, still holds true. We also ran some numbers with the CPU overclocked to 4.7 GHz on all cores, which I will use for comparison later in the review. At a later point it would be an interesting academic exercise to see the effect with a significant resolution increase, although many thought processes would tend to suggest that such an environment would only stress the GPUs more, and make the differences between the CPUs even less than they already are. The take home message is this: Devil’s Canyon, specifically the i7-4790K, is a good way to get a ~14% increase in CPU-limited performance metrics over the Haswell i7. It would seem to offer higher limits for overclocking, although your mileage may vary. For Ivy Bridge users, the rewards are even greater. However, gamers at 1920x1080 resolutions gain very little. For this analysis, we used the ASUS Z97-Pro motherboard for all LGA1150 CPUs alongside 2x4 GB of DDR3-1866 8-9-9 G.Skill DRAM set to DDR3-1600 9-11-9 1T to coincide with the memory supported by the new CPUs. Cooling duties were taken by a Corsair H80i in a push-pull configuration.